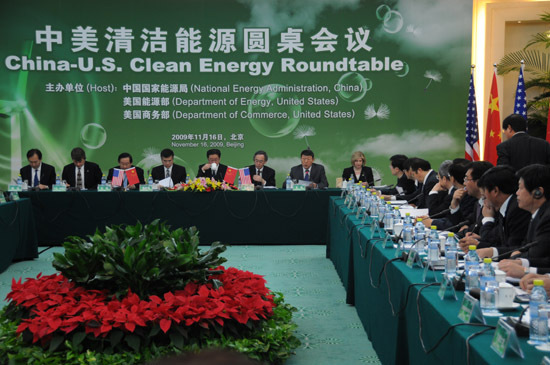 On the morning of November 16, 2009, the Sino-US Clean Energy Round-table Meeting was held grandly in Beijing Diaoyutai State Guesthouse as significant content of the US President Obama�s visit to China. Tianguan Group was invited to take part in the meeting with representatives and make a keynote speech. The round-table conference was jointly hosted by China National Energy Administration as well as US Energy Department and Commerce Department, on which US Energy Department minister Steven Chu, Commerce Department minister Gary Locke as well as China Ministry of Science and Technology minister Wan Gang and National Energy Administration deputy director attended the meeting and gave speeches respectively. Relevant principals of the two governments and entrepreneurs in the clean energy field and experts, altogether more than 100 people attended the meeting. The meeting invited from both countries respectively 6 representative experts and entrepreneurs to attend the meeting and give a speech with regard to the topics in the clean energy field such as solar energy, biomass energy and wind energy and others drawn close attention from both countries. Tianguan Group�s president Zhang Xiaoyang made a speech on the Sino-US cooperation in the biomass energy field on behalf of China. He briefly reported the development of the biomass energy industry in our country, introduced the work done by Tianguan Group in the biomass energy field, proposed the suggestion of effective cooperation between China and the US in cultivation of high yield biomass energy crops, problem solution in fiber ethanol industrialization and ethanol Bio-PE and other fields and expected broader cooperation of the enterprises from both countries to make positive efforts for the low-carbon economy of China and the US and the improvement of global climate change.